With our Wizard-driven interface, you can safely erase sensitive data from your hard drive in 3 easy steps! Create a Boot CD and insert into your CD-ROM drive. Delete your data with confidence. When we say 100% erasing, we mean 100%! 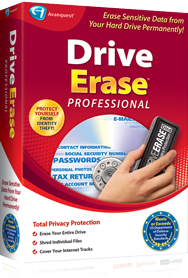 There's simply no commercial file eraser software software available that does a more complete job of permanently eliminating data on your hard drive than Drive Erase Pro™.